Modern, minimalist, magnificent—welcome to your next event’s venue. The Brick is a beautifully renovated warehouse overlooking the St. Joseph River in South Bend. Brick interiors keep as the solid stylish base, so the space easily transforms into anything you want with added decor. 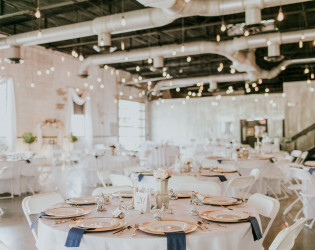 The Brick is a beautifully renovated warehouse overlooking the St. Joseph River in South Bend, just two miles from the campus of The University of Notre Dame. Our rental fee covers the use of our space from 10AM on the day of your reservation. Our availability and rates are up to date on our website at www.thebrick.net/calendar. We pride ourselves on being a blank slate for you to tailor to your needs. 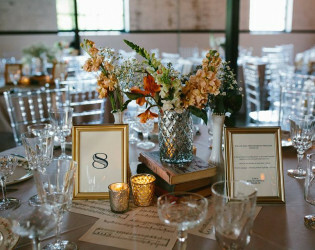 We have tables, chairs and linens available for rent. However, we are committed to our clients having choices so we do not limit you to any rental or catering companies. You may bring in any vendors of your choosing. We have a list of vendors on our website and we are finding new ones all the time. We have a large space for caterers to use for set up. In addition, sales tax, bartender fees and security are extra. We have a small host room and private, handicapped accessible restroom located in the back of our main hall. Most people don't know that you can park on both sides of Northside Boulevard in front of our event space. Lots of times there will be a packed house, but you can get a front row parking spot because nobody has taken advantage of the street parking. The river is the backdrop, the room is industrial like you’re on the set of a Hollywood film. And the bar is a modern version of a stylish Manhattan speakeasy from the 1920’s. 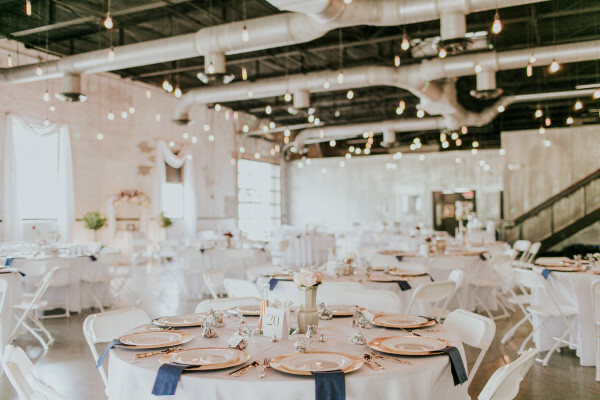 Upscale, timeless, and Old Hollywood- your guests will enjoy strikingly beautiful industrial architecture mixed with a soothing patio overlooking the St. Joe River. 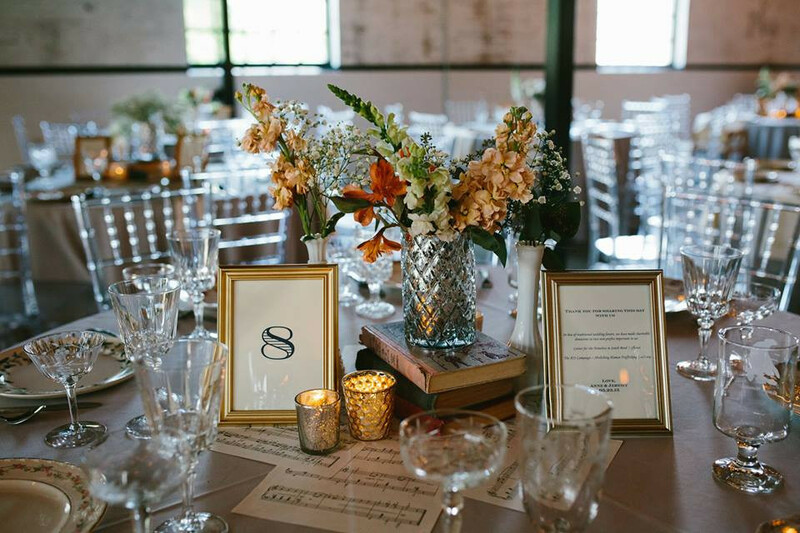 Our event space is unlike any other in the city. With a 5,000 square foot open floor plan The Brick offers an urban, spacious venue that can be customized to meet your needs. Simple and elegant, with brick exterior and interior, loft ceilings, exposed lighting, and dock doors opening onto the patio, you have a blank canvas to create your vision. Come visit us and you will see why The Brick has earned a glowing reputation in South Bend! Originally the Eckrich meat factory dating to 1935, the building has been restored to it's 1930's industrial roots with a touch of art deco flair. Our bar originated in 1920's Chicago and was formerly housed at Bridget McGuire's, a popular bar with the Notre Dame crowd. The artist-designed concrete slab counter is supported by wood beams salvaged from the original Oliver Chilled Plow Factory, as was our floating stair leading to the small mezzanine. 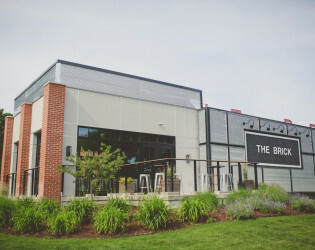 The Brick is owned by Notre Dame alumni Corey and Becky Cressy who wish they would have had such a venue for their wedding in 2002. Corey brought his real estate experience to the renovation process while Becky employed her architectural expertise. They combined their self-proclaimed "opposite personalities" to create a perfect dichotomy in the design of The Brick featuring a minimalist industrial aesthetic with glamorous touches of Old Hollywood. Our recently renovated all-season porch adjoining the bar area includes dock doors that can be opened in warm weather, giving a great view of the river! We also have two portable flat-screen televisions and a microphone that are available at no extra cost. • The Southhold Preservation Award by The Historic Preservation Commission of South Bend & St. Joseph County. • The Excellence in Construction Award by the Michiana Area Construction Industry Advancement Fund. We have been featured in Style Me Pretty, Wedding Wire, Wedding Day, The Wedding Mag, The South Bend Tribune and in several blogs including Merry Me Events, Megelaine Images , & Jose Phiney Photography. Our art deco bar is open for private events. Our bar is open to the public on Mondays, 5:00-9:00 pm year round so clients can stop in for a drink, see our space and chat with a manager. During the warmer months we open to the public on Mondays & Tuesdays at 5:00 with live music on Mondays. 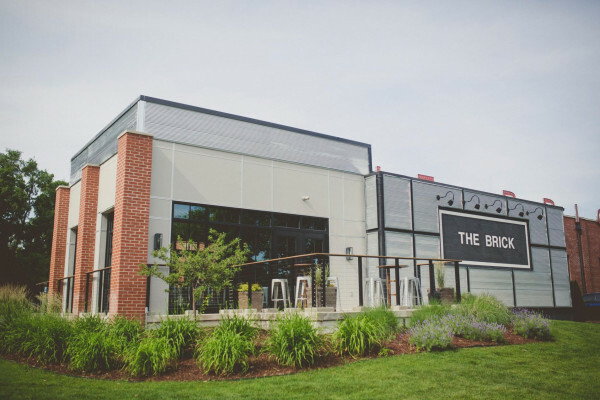 With a 5,000 square foot open floor plan, outdoor patio, and an art-deco bar, The Brick offers an urban, spacious venue that can be customized to meet your needs. Our renovated deck area expands our bar, adds an indoor fireplace and dock door open to overlook the river.